A particularly alluring example of Bellis’s work, this composition centres a characteristically haphazard pile of oysters and mussels on a cut lemon and a glass of wine. The loosely painted background, with a warm base visible under the scumbled colour, gives an atmospheric resonance to the composition, and is picked up in the equally loose drawing of the heaped mussels. 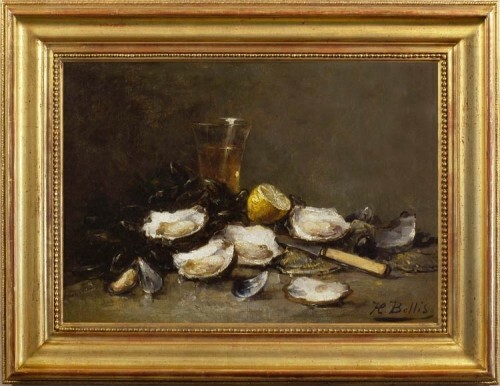 Bellis’s paintings shine with highlights; he delights in the fresh seawatery quality of shellfish; the sheen of nacre inside shells; the cut and dewy surface of a lemon; a polished glass with its clear reflecting liquid. All these highlights are contrasted with the dark ground and mussel shells, investing the still life with a paradoxical animation; – this is not a painting which could justly be labelled ‘nature morte’.